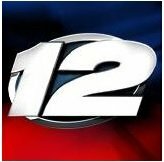 News TV Channel / KXII, VHF digital channel 12, is a CBS-affiliated television station located in Sherman, Texas, United States which also serves Ada and Ardmore, Oklahoma, and Denison, Texas. The station is owned by Gray Television. KXII maintains studios located on Texoma Parkway (SH 91) in Sherman, and its transmitter is located southwest of Madill, Oklahoma. The station's signal is relayed on low-power translator station KXIP-LD (channel 12) in Paris, Texas.